Sallins, and Rush and Lusk train stations are getting secure bicycle lockers. This follows the rollout of the lockers to Balbriggan, Skerries, Malahide and Heuston stations last September. 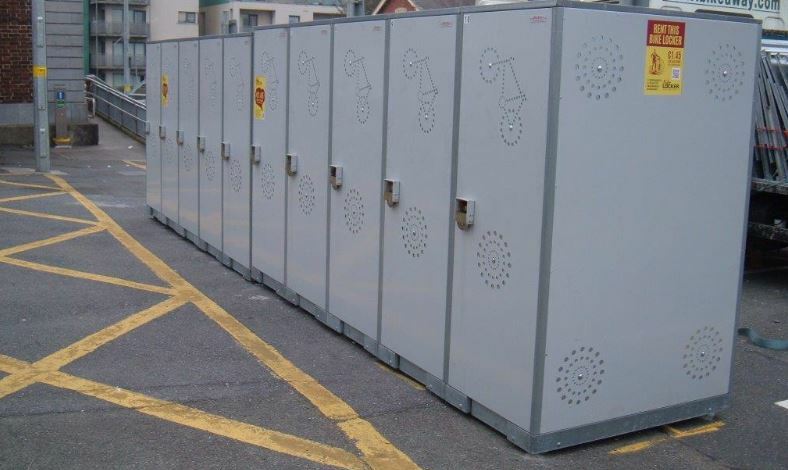 It means there’s now nearly 200 lockers at 20 locations in the greater Dublin Area — a list of all locations is viewable at Bikelocker.ie, the company which rents the lockers. The list includes Dart and Commuter train stations and one Luas stop, Dundrum. “As you know the rental fee for the Bike Locker is just €1.45 per week which for a year is €75.00. I don’t think you can get car parking at your station for that price,” said Richard Strahan of BikeLocker.ie. Bikes stand vertically in the lockers and there’s also storage room for items such as rain gear. The lockers rented to individuals for sole use 24/7, so some transport observers see them as a limited solution for mass bicycle parking, but a good solution to keep bicycles safe at train stations which are regularly targeted by bicycle thieves. The numbers of lockers at any one location can also be scaled up. Lets keep our fingers crossed and they do the same for on street locers. Great facility. Any word on when they will be coming to Hazlehatch station? Badly needed there.